Stories on Instagram have proven to be a useful and high-reach channel, as shown by the big benchmarking of story metrics. However, social media managers keep asking themselves one question: How long should a story be? If you publish many stories within 24 hours, they will be grouped and shown one after the other. Does this chaining of stories have an influence on the reach and when do followers get annoyed? Fanpage Karma has reviewed 5 million stories from February 2019 and comes to surprising results. Stories have a lifespan of 24 hours. If a profile posts multiple stories in a 24-hour timeframe, they are grouped and played in sequence, starting with the oldest story. This results in a big story of several frames. The stories are then no longer individual but a part of a group. This has implications for their reach and user behavior, as the study will show. These effects affect most of the stories. As the following graphic illustrates, single stories consisting of only one frame are not common and mostly found at vey small profiles. Even with profiles of 1,000 or more followers, 62% of the stories consist of more than one frame. For very large profiles, only less than a fifth of the stories are loners. To pinpoint the impact of the length of a story, it was important to make sure that the users had to see all frames at once. For this purpose, the frames could not have been too far apart in time. This would have meant that some users would have seen only the first or the last part of these stories. To exclude these effects, only the stories whose single frames were published within 10 minutes were examined for the detailed analysis. The results are meaningful and can be easily transferred to the stories of all types and lengths. On Instagram, the user always has the option to swipe away the complete group of stories (the so-called Exit). Like the sword of Damocles, this danger is an imminent threat to the reach of the every single frame: Once driven away, the user will no longer see the frames at the end of the story and their content will never reach them. On average, about 5% of the stories are swiped away. At first glance, this seems to be an acceptable low value. But this is the overall average of the exit rates of all individual frames. At second glance, there is an interesting detail. The Exit rate is the highest in the first frame of a story. 8% of the users decide here that they do not want to continue watching. In the second frame, the exit rate drops to 3%. And it sinks further and further while the user dives into the story. At first, the results seem counterintuitive. You might have thought that with every additional frame the Exit rate increases, but just the opposite is the case. The users, who are not interested in the content of the story, leave the story early, leaving only those who really care about the story. 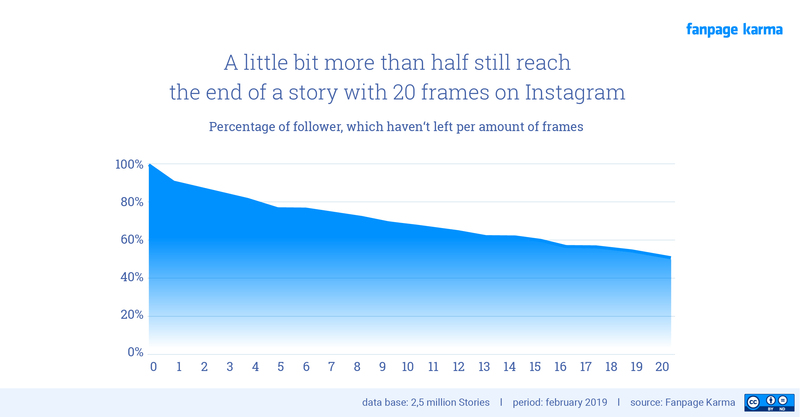 However, the decrease in the exit rate per frame must not hide the fact that longer stories lose followers continuously. After only five frames, only 80% of the users who were reached at the beginning of the story are still watching. After 20 frames, there are only 56%. On a positive note, one could also say that more than half of the users endure a story with more than 20 frames and still have not swiped on. Depending on what you want to achieve, that could also be an amazingly good value. One thing is clear: Anyone who wants to deliver an important message via a story, has to put this message at the very beginning of a story. There is an interesting difference in the types of frames. A story can consist of individual pictures or videos. Especially at the beginning videos are swiped away much less. On the other hand, that changes the longer a story gets. As the number of frames increases, users tend to linger if the stories consist of images. That’s easy to understand. On the one hand, pictures are only 5 seconds long, videos 15 seconds. A story with 5 frames consisting of pictures is 25 seconds long. The same story with videos takes 1:15 minutes. And that’s an eternity on social media. On the other hand, the user is ready to pay a little more attention to a video at the beginning, because in contrast to the picture something exciting could happen later on. These two effects explain the different courses of crash rates at different times. The most amazing finding is that the length of the story correlates with the reach of the entire story. Only the reach of the very first frame was compared, because from there the users decide themselves whether they exit or stay. They have very little control over the first frame, which is presented to them by the Instagram algorithm. And the effect is positive. Except for very large profiles, a story with many frames reached more users than one with fewer frames. The start of a story was seen by more users, if the story had more frames. An interesting effect, since the user has no influence on it. Stories are a suitable way to share even longer content. The length has no negative impact on how many users are reached with the story, rather the opposite. Nevertheless, one must be aware that many users cancel the consumption of the story. Therefore, stories should always start with the most important or compelling content snippets.